Michael H. Hunt is Everett H. Emerson Professor of History Emeritus at the University of North Carolina at Chapel Hill. 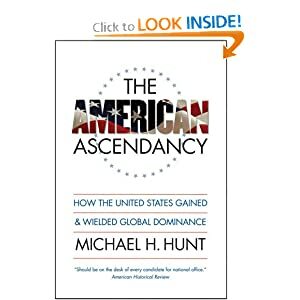 His ten books include The American Ascendancy: How the United States Gained and Wielded Global Dominanceand A Vietnam War Reader: A Documentary History from American and Vietnamese Perspectives. His comments “on Washington and the world” appear at UNC Press Blog (where this post originally appeared) regularly and can also be found on his website. Let’s start with the dubious term. Isolationism began its career not as a carefully considered historical concept but as a term of opprobrium constructed to discredit critics of Truman administration policy during the early Cold War. The chief targets were initially Republicans doubtful about formal treaty commitments in Europe and about big military budgets resulting from global containment. Many of these skeptics hailed from the Midwest, where opposition had been strongest to Franklin Roosevelt’s pro-British tilt at the outset of the European war and where fear of militarization and big government was also pronounced. Truman and his supporters overcame the skeptics by linking them to a persistent, pervasive American reluctance to engage seriously and responsibly as world leader. Given what seemed a deep, dangerous strain in the national psyche, critics of isolationism from the late 1940s onward were always on the lookout for revival of the old head-in-the-sand mentality. They were quick to remind the country of how isolationism had first prevented the country from realizing its global destiny after World War I and then blinded Americans to dangers that Hitler had posed. To be called an isolationist in the context of the Cold War was nearly as bad as being called a communist. Whenever someone worried publicly about general U.S. overcommitment or opposed particular interventions such as the one in Vietnam, the first response was to slap the heavily-fraught “isolationist” label on them. The era most often featured in the isolationist indictment is one leading up to World War II. But rather than a negative example, it arguably offers a usable past that would repay study for anyone, not least Republicans, trying to chart a new policy direction today. From the late 1890s to the early 1930s their party controlled the White House with only an eight-year hiatus. During that time they followed a course quite different from the ideologically militant policy that we now associate with Barry Goldwater and Ronald Reagan.